I love organization and planners. I’ve tried so many through the years and they are awesome except for one small… little… problem. I hadn’t found a planner for special needs families. I mean really, when you have a special needs kiddo, you have an entire separate part of your life that you need to organize. Am I right? In addition to typical calendars and meals planners, us moms of special needs kids have to keep track of more. I am talking about doctors and specialists, therapists, IEPs, sometimes medications, triggers, behaviors, sensory problems, plans of action. I could go on and on. 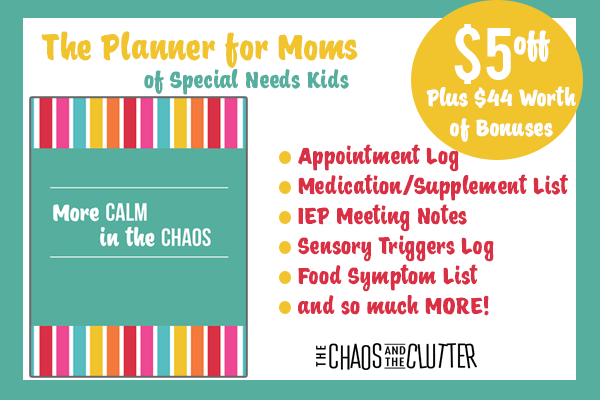 That is why I’m so excited to share with you all this brand new planner for Moms of Special Needs Kids. It is called The More Calm in the Chaos Planner and it is simply amazing. You guys all know that my oldest has special needs including autism and sensory processing disorder. He also has had a whole host of allergies and behavioral issues in the early years. This planner covers it all. This planner contains an entire section devoted to food symptoms, another for sensory triggers, and still more for behaviors. Guys, this is a life saver. I remember when Adam was little and I had all of these notebooks with random notes in it trying to make sense of what was triggering what. Still more calendars and appointment books. This planner will save you time and energy for this one simple fact: it will keep all of your notes and journals together! But, it doesn’t stop there. What I love most is that it is efficient and pretty. Yes, I said pretty. I love the colors. I love the boxes to check. It is my type of planner. This thing has it all. There is even a self care plan for mom. This is a life changer, seriously. What else could you ask for? Best of all from October 18-23 this planner for moms of special needs kids is listed at a discounted price! It is only $24.99 and includes several bonuses. 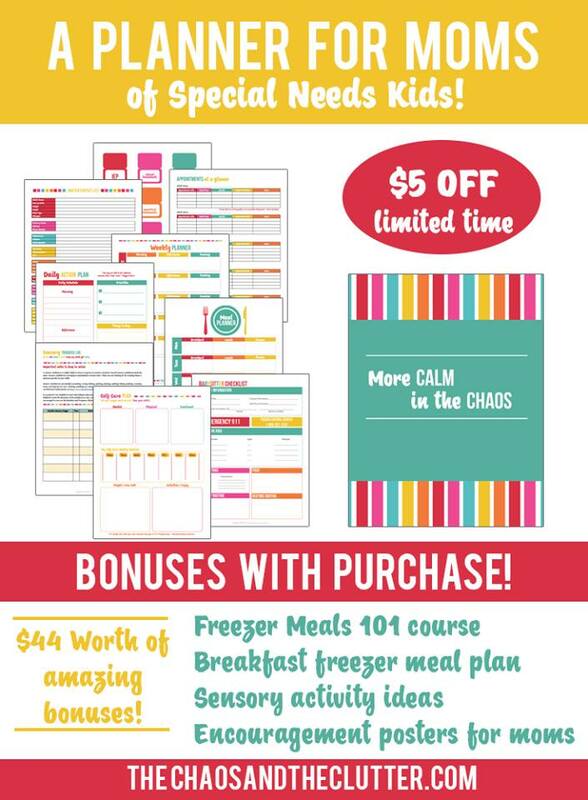 ($44 worth of bonuses in all including: Launch Special: Reduced price ($5 off) plus Freezer Meals 101 course ($29 value), Printable Mom Posters ($5 value), Sensory Activity Ideas ($5 value), Breakfast Freezer Meal Plan ($5 value)). If ordered by October 23rd you will receive access to Freezer Meals 101, Breakfast Freezer Meal Plan, Sensory Activity Ideas and more! Hurry!!! Have you been searching, just like me, for a planner for special needs families? Leave a note below!